Anyone who knows me personally would never peg me for a beauty or make-up enthusiast. I always had one of the plainest faces at school and work simply because I was too lazy to learn and I wasn’t as kikay as my other friends. However, I’ve recently been attempting to learn how to do my own make-up because I realised that as a woman of my age and as a person whose stress just shines through her face (lol), I need to at least know the basics to make myself look decent when the occasion calls for it. I’ve collected a couple of essentials for my kit already like BB Creams, blush and lipstick, but I always find myself browsing for products to add to my newbie arsenal. I also like to shop for anything that can help with my acne and blemishes (sigh, still from my PCOS). So would you imagine my surprise when I woke up one day and read an email from BeautyMNL asking me to give their site a test run? Insert shocked emoji here! BeautyMNL is the No. 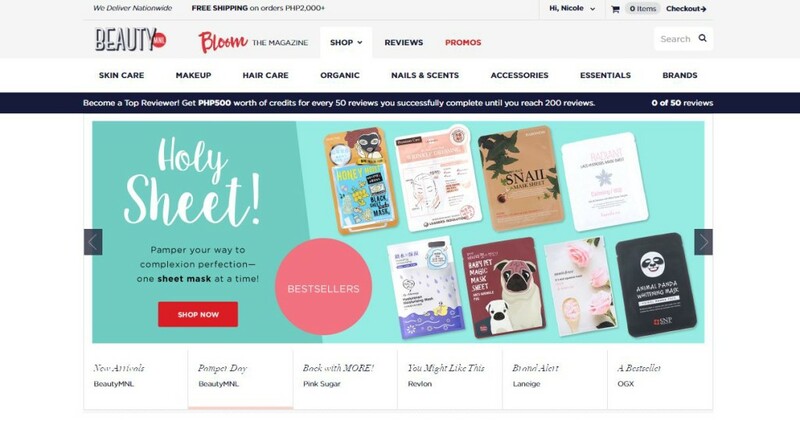 1 and biggest beauty site in the Philippines where Filipinas can discover something pretty and new everyday. A major part of BeautyMNL is the Shop. This is where you can browse through a wide array of beauty and make-up products. The Shop also carries a good range of mommy-and-kid friendly products. I’ve been on BeautyMNL several times before. I see their ads a lot in Facebook and I always enjoy browsing products in their Shop but never got around to purchasing anything yet.. until now! It’s easy to navigate the website because you can view products through different categories or by brand. When you select an item to view, you get a detailed description of the product along with reviews from other users, which is something I really find helpful. From browsing products to checking out and finalizing the purchase, the entire process was easy peasy. I used PayPal (as a personal preference because I want to protect my card information) and got prompt confirmation of my orders. I monitored my order through the Order Tracking section of my BeautyMNL account and I received my package within two business days. Are you wondering what products I got? Tresemme Keratin Smooth Infusing Shampoo and Conditioner Pack – I’ve always wanted to try Tresemme products, so when I saw this bundle for P199, I immediately added it to my cart. I’ve already tried the conditioner and loved it! Zenutrients Mild & Gentle Baby Shampoo – The last time I visited a Zenutrients shop they had no stocks of this product. I was happy to see this along with other Zenutrients products available in the Shop. Black Beauty Crystal Anti-Dandruff Shampoo – This was a freebie that came with my orders. You can click on the link if you would like to check out the full-sized product in the Shop. Lux Perfumed Soap (Magical Spell) – Another freebie I got with my purchase. Although they don’t have the actual bar soap in the Shop, you can check out the Lux body washes instead. Face Masks – I adore Korean face masks, so I couldn’t resist buying a bunch! I got myself the Innisfree It’s Real Squeeze Bija Mask, Innisfree It’s Real Squeeze Cucumber Mask (they were both 32% off), Leaders InSolution Derma Soul Bright Mask with Acai Berry, and Leaders InSolution Bio Medi-Curing Calming Dressing Mask. Clover Collection Large Duo Fiber Brush – I saw good reviews for this product so I decided to give it a try and add it to my current make-up tools. E.L.F Expert Liquid Eyeliner – I could never seem to learn out how to apply eyeliner, so I figured I just need to keep practising. I saw the product review on how this was a good choice for beginners. Maybelline Volum’ Express Hypercurl Mascara – Believe it or not, this my very first ever mascara! I never really cared for it, but I thought it would be another great addition to my kit. Plus I got this on sale for only P149! Skin Genie Lip and Cheek Stain Alive! (Eggplant) – This is a nice little lip and cheek stain that I thought would be perfect for everyday use like for when I have to run errands or drop the Little Troublemaker off at daycare. Pretty good steal for P80. Swan Egg Classic Blender – Since I can’t afford a Beauty Blender yet, I decided to start cheap and try out this egg blender first. Instantly Ageless Eyebag Eraser – I saw this product while browsing the Shop and it got me curious because I have ridiculously large eyebags. Crossing my fingers and hoping this works because we have a big event at work this weekend! Beach Born Bam Balm – This is officially my new favorite lip balm! It has this sugar scrub that makes my lips so much softer and I haven’t had dry lips since! Beach Born Sea Salt Spray – I bought this out of curiosity but haven’t found the chance to try it out yet. I have pin-straight hair so I hope this can help give my hair some volume and waves. Made by David Organic Green Tea & Lemongrass Hand Sanitizer – I’m a sucker for anything green tea, so I got myself a green tea sanitizer to stash in my bag. Beauty Bakery Witch Hazel Facial Mist – I love how refreshing this spray is, and how it helps calm my breakouts. I use it to freshen up while working or after a long day when I’m too lazy to wash my face. That pretty much sums up my BeautyMNL haul! If you’re a beauty addict, make-up enthusiast or a simple mom like me who likes to make herself look pretty now and then, I encourage you to visit BeautyMNL for an array of well-curated beauty and make-up products. You can grab some stuff for your kids too while you’re at it! To make things more exciting, why don’t you show off your gorgeous beauty looks by joining BeautyMNL’s monthly #selfieMNL contest? If you like taking selfies (we looove selfies! ), join the #selfieMNL contest! Get a chance to win a Printster polaroid of your pretty face and a PHP200 BeautyMNL GC. Click here for the complete details. Have you shopped on BeautyMNL before? What are your favorite products on the website? Feel free to share any of your favorite finds, I might be missing out on some good products!